It has been over 2 hours since I got back to my flat, but I am still freezing cold. I spent the evening watching Bath City beat Newport County in the Setanta Shield. This is normally a mediocre cup, but due to failings in other competitions this season, it has taken more significance. Therefore, I was pleased when City thrashed Newport 4-1. Anything less than this rout would have made the whole evening a total waste of my time. It was bitterly cold and there were moments I wished I had stayed at home with beer and crisps, watching footy on TV. Instead, I was stood at Twerton Park, in Arctic-like conditions, without even a hot drink (the tea bar was closed). I may still be cold, but I am happy with the result. Something very strange happened to me this morning. While getting ready to leave for work, I noticed a woman sitting, wearing a dressing gown, on the next door neighbours shed. She then jumped off the shed (which must have been 7 foot high), into the ground floor flat’s garden, wandered around, before attempting to get back into, what I assume to be, her own garden. I really didn’t know what to do. Should I have phoned the police? There was no chance of her breaking into the ground floor flat and certainly not into mine on the first floor. I don’t think calling 999 would have been appreciated by my apparent neighbour, or necessary – she didn’t appear to be dangerous or hurt. She just looked like she was high on drugs and reminded me of Amy Winehouse. I have never seen her before and don’t really know where she lives – there are many flats on my road, which change ownership on a frequent basis. All very freaky. I hope she was OK, but wish I never have to see her or anything like that again! Due to the way my site is published through the Blogger system, it isn’t simply a case of removing this line from the HTML code. As I pay for my own hosting and wrote the majority of the template myself, I think it’s a bit of a cheek of them to do this – especially without informing me. I therefore need to find a clever bit of code that I can stick in my template, which will remove that stupid B and replace it with the star icon I used to have! Why is it that my well-loved clubs, Bath City and Leeds United, never manage to both win on the same day? This season, I am yet to have the joys of celebrating a duo of football victories. Take today for example. Bath City are playing St. Albans. 1-0 up at half time and cruising. I check the score from Leeds to find they are drawing 0-0 with Walsall. Shortly into the second half of the City game, I check the Leeds score. To my joy, I see Leeds are wining 1-0. Within minutes of learning this news, St. Albans equalise. I then hear that Leeds are 2-0 up; only to see Bath totally lose the plot and concede a second goal, winning the game for St. Albans. Something strange is going on…. Yes, I am aware that both my teams won on 27th September and 21st October BUT on both these dates, Bath City were playing in the FA and Somerset Cup; therefore I believe my theory only applies when both teams are playing league games. All the VoIP phones went down. Part of the patient administration system broke. 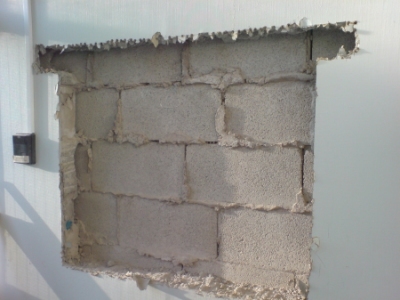 Karl was off sick, and contractors turned the office into a building site, by bashing down a large chunk of wall – it was horrendously noisy. They are far from finished.